American manned lunar lander. Study 2009. Prototype lunar lander developed by Armadillo Aerospace with private funds. Quad was the only entry in the 2006 competition for the X-Prize Cup Lunar Lander challenge. Status: Study 2009. Thrust: 13.40 kN (3,012 lbf). Gross mass: 680 kg (1,490 lb). Unfuelled mass: 290 kg (630 lb). Specific impulse: 200 s. Height: 1.90 m (6.20 ft). Diameter: 1.90 m (6.20 ft). Two VTOVL vehicles, Pixel and Texel, made three unsuccessful landing attempts. The vehicle used four cold gas thrusters for attitude control. The main XPC-06 engine was pressure fed, and fitted with a 2:1 ratio nozzle for sea level operation (the specific impulse shown here was for operation with that nozzle; vacuum performance would be significantly higher). The uncooled thrust chamber was of carbon fiber reinforced graphite, built by Cesaroni Aerospace, and could handle burn times of over 180 seconds. The vehicle was autonomously controlled by a software program using GPS and fiber optic gyroscopes for position and attitude inputs. 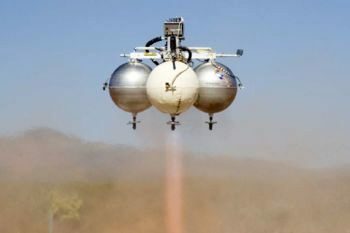 Quad demonstrated technology that was to lead to a single-crew suborbital VTOVL prototype for the full-scale Black Armadillo. Spacecraft delta v: 1,600 m/s (5,200 ft/sec). Family: New Space Tourism. Country: USA. Propellants: Lox/Alcohol. Agency: Armadillo Aerospace.